Dubbed as New Zealand's most famous surf beach, Piha Beach is guarded by a coastal formation called Lion Rock. The rock receives its name from its shape - a large full maned male lion with front legs outstretched. 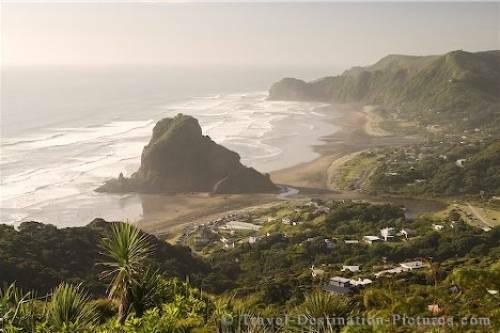 Piha Beach is a popular weekend getaway destination for many Aucklanders who wish to escape the city. As well as a small permanent population, Piha boasts an abundance of baches (aka holiday homes) and during the summer holiday months bursts at the seams as families take up temporary residence in their baches. Piha Beach and Lion Rock, summer, near Auckland, North Island, New Zealand. Picture of Lion Rock looking over the Piha Beach on the West Coast of the North Island, New Zealand.